Romania: Craiova facing expropriation trouble ahead of new stadium construction? With many observers still stunned by the ambitious plans of Craiova mayor, the city faces a major obstacle, which may not hold the project overall, but inflate its budget significantly. Gazeta de Sud report. The current sports complex with Ion Oblemenco Stadium, two training pitches and indoor hall is expected to be completely turned around in upcoming years. 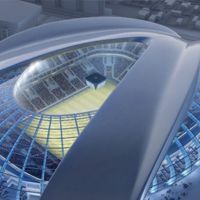 At its heart a new 40,000-seat stadium is planned, much more ambitious than many expected and – according to some critics – the city actually needs. Craiova mayor Olguta Lia Vasilescu hopes the entire complex (including a secondary stadium for 5,000 and extensive green areas) can be built for roughly €100 million. This sounds very optimistic, way below average costs of similar projects around Europe. And even with the hopeful estimate, Craiova hasn’t got the resources to fund it. The municipality hopes for support from the European Union and federal authorities to limit own expenses. However, even if the applications for external funding succeed, the city needs to face another problem. The new centre is to cover 15 hectares (37 acres), a lot of which is now covered by houses. Not all of them are built with permits, but the problem of buying them or expropriating owners by force remains. Despite municipality claiming the stadiums itself can be built even with houses standing, completing the complex with residents on the land isn’t possible. Early last year the city had to compensate an expropriated resident of the area with very significant amount of €300 per square meter. Should similar price be kept for the several dozen of houses around, the project may cost up to €30 million more before even starting. Will this be the end of Craiova’s extraordinary stadium? This we are yet to see.